"The sheer scale of offences in this case is shocking and we hope that this sentence will prove a deterrent to others”. Not unsurprisingly, many people disagree with the sentence that was handed down. "The NGO stands for gamekeeping within the law and we condemn these actions utterly. The selfish, stupid actions of one man - who was not and never has been a member of the NGO - must not be used to tarnish the good name of gamekeeping, which does so much for the countryside and its wildlife. The gamekeeping profession genuinely deplores those very, very few among their number who break the law. They are the pariahs of the modern keepering world, losing the right to call themselves gamekeepers in the eyes of their peers." Last week the RSPB distributed copies of their latest Birdcrime report. It makes dreadful reading. The disgusting actions of a few falconry centre owners, egg collectors and bird dealers are also listed. The pages and pages of crime statistics are depressing and they have certainly produced a series of provocative press releases. But amidst the horror of stories such as those involving Lambert and his ilk there is some positive news. Below I have indexed the total number of wildlife incidents reported to the RSPB since 2009 (prior to this the figures are not comparable) against all crimes reported by the police. Thankfully both are falling. 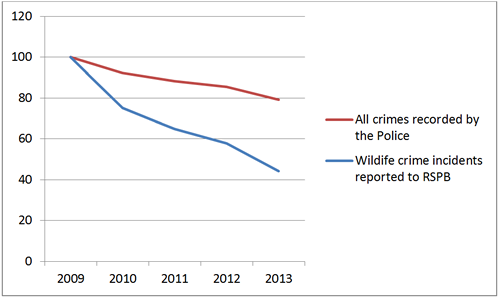 Better still the number of reported wildlife incidents is falling twice as fast as all crimes. It’s a crude analysis but it would indicate that all the hard work to reduce wildlife crime achieving just that. The Police and all those involved in the Partnership for Action Against Wildlife Crime (PAW) should be proud. Let’s hope cases like the one in court yesterday become history.